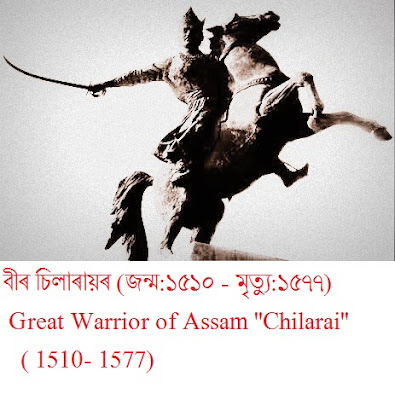 Chilari was a great warrior, commander of Assam, when his brother Narnarayan ruled Assam. Great warrior, Chilarai was born in 1510 A.D. His father Vishwasingha established Kamatapur in 16 th century. His mother was Padmabati. Chilarai was a great warrior, a scholar and social worker. The real name of Chilarai was "Sukladhaj"( which means white flag). But, for his great speed in the war, he was famous by the name of "Chilarai"(which means- like the kite bird, in greek mythologies kite bird is known as who resurrect death). Before his braveness,skill, many kingdom such as Buthan, Ahom was defeated. Besides war, Chilarai dedicated his time in reforming the Kamatapur Kingdom. Chilarai build the, Kamakhya, after being built and also destryoed Narakasur, ( a king who loved Kamakhya, but kamakhya rejected his love, so broke the temple,he made for his love) famous temple of India, Chilari also build the "Hajo Hayagrib Madhab" temple. In his guidance, many roads, pools are made too. To find a person, with such extraordinary characters is very rare. He was a great admirer of scholars, religious preacher. Chilarai helped the great saint of India, Srimanta Sankardeva, who was a great preacher of "Vaishnavism"( who believe in one god, krishna), a sub-religion of mighty hindu religion. Chilarai became a follower of Sankardeva, even though was a Sakta( who believe in many god). After a greatly influencing 67 years, Chilarai died in 1577 A.D.